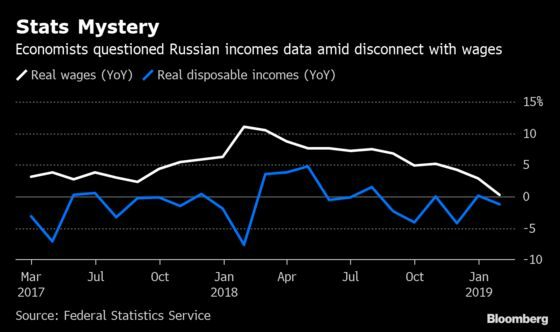 (Bloomberg) -- Russia will stop publishing monthly data that’s shown a slump in disposable incomes for five straight years after the indicator was criticized for using methodology that’s decades out of date. The Federal Statistics Service will start releasing quarterly income data starting next month and historical numbers will be recalculated going back to 2013, head Pavel Malkov said at a briefing with journalists in Moscow. The new methodology will include data on online sales and sales from smaller retailers among other things, he added. Incomes have declined since 2014 amid a rise in retail sales, prompting many analysts to question the reliability of the underlying data. Moscow-based VTB Capital published a three-page research note earlier this month criticizing the outdated methodology and recommending that economists disregard the income data entirely. The statistics service, known as Rosstat, comes under regular fire for the quality of its data, especially after growth numbers for 2018 released last month massively outstripped economist estimates. The Economy Ministry took control nearly two years ago and Malkov, a former economy ministry official, was appointed head late last year to address issues including the collection of primary data. Economy Minister Maxim Oreshkin told the Vedomosti newspaper last week that Rosstat should consider changing its methodology for incomes data. Rosstat developed its methodology for calculating disposable incomes in 1996 and since then it has only undergone one cosmetic update more than a decade ago, according to VTB Capital’s note. Analysts at the bank recommend economists use “lower level” data on pensions, wages and benefits instead to build their own picture of real incomes. Retail sales in February came in better than expected, expanding 2 percent, Rosstat reported on Wednesday. Economists in a Bloomberg survey had forecast a 1.5 percent advance. Wage growth adjusted for inflation decelerated.